I use mini Jenga blocks in groups of 2-3 students to play. That way, everyone gets an abundance of questions for review! 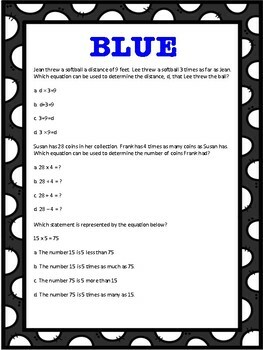 These questions focus on: equations, multiplication, division, area, place value, and rounding. 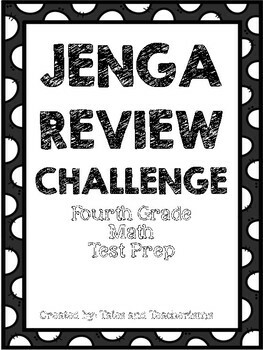 1.Set up your Jenga tower. 2.Take turns pulling a piece. 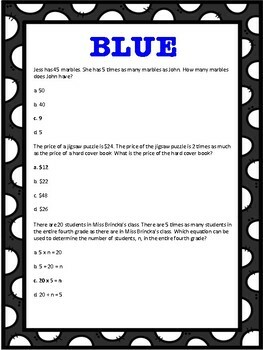 3.Solve a question for the color you pulled. BOTH students solve the question. If the student who pulled the piece is correct, they keep the piece. If the opponent can correct them, they keep the piece instead. 4.The first person to collect one of each of the six colors available wins! 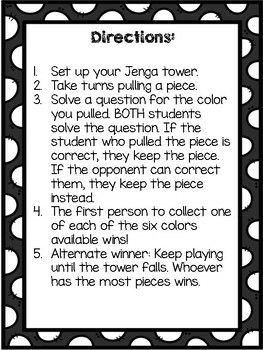 5.Alternate winner: Keep playing until the tower falls. Whoever has the most pieces wins.